With the Easter holidays upon us we have our fingers crossed for some sunshine as you will likely be looking for ways to entertain the kids (big and small) especially if like us you have play dates and help friends out with childcare to enable each other to work through the school holidays. 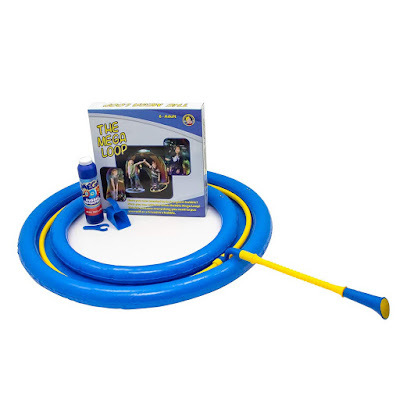 There are loads of activities that suit the big kids, but not the small kids and vice versa but we have been testing out this Mega Loop from Uncle Bubble and it is fab fun for all the family of all ages from 6 up. The kit contains a Uncle Bubble Mega Loop, a giant inflatable dipping tray and a bottle of Uncle Bubble formula, everything you need to learn, create and have hours of fun putting yourself or a friend in a bubble. Simply use the inflatable pool/ dipping tray and fill with the Bubble formula and you are all set to make giant bubbles to fit your friends and family inside!! We have had hours of fun and laughter creating people bubbles, large bubble doughnuts, bubble sausages and even attempted making bubble sculptures by chopping these into smaller shapes and sticking them together. It really is so simple once you have got the hang of creating the bubbles, the trick is not to make it foamy!!! I am really looking forward to the warmer weather and getting outdoors with the kids to use this as i think it is going to be a huge favourite all summer especially at family gatherings where the kids can show off their new found tricks of putting grandma in a bubble! For your chance of getting your hands on one of these amazing sets then simply enter below and keep your fingers crossed that you too will also be having hours of outdoor fun this summer with the Uncle Bubble Mega Loop.